Having not been abroad for a year I'd been really looking forward to visiting Spain again. Our plan was to briefly visit Girona before going to the Psychobilly Meeting in Pineda de mar. Then we would stop off in Barcelona before spending a few days in Seville. On this trip I was particularly keen to find some really good tapas as on previous trips I felt the tapas we'd tried had been tourist tapas. My wife was looking forward to seeing what vegan options were currently available in Spain and we were both really excited about exploring Girona and Seville for the first time. With the van parked up safely in long stay we made our way into the airport. I usually find Stansted Airport quite hectic but today everything was going quite smoothly which was a bonus. I fancied a breakfast before boarding the plane but as midday had passed our options were limited. We ended up going to Giraffe where they were serving an all day brunch. It was overpriced as airports always are and wasn't particularly special. This cost me £15 by the time I'd ordered a coffee and some toast to go with it, it would keep me going until I arrived in Girona though. We hadn't pay extra to reserve seats on our Ryanair flight so my wife and I sat separately from each other to start with. This is a recent change to Ryanair's policy where you will now be randomly allocated a seat if you haven't paid to choose one, the randomly allocated seat is highly unlikely to be next to the person you booked with. Luckily the seat next to my wife became free after the person next to her moved to another seat, so about half an hour into the flight we were together again. We ordered a couple of beers to mark the start of our holiday, an ice cold and warm can arrived so we mixed them together to create an almost cold beer. The joys of flying Ryanair! The flight arrived in Girona on time and within about ten minutes of getting off the flight we were through customs and outside the terminal building. We usually fly into Barcelona where it takes much longer to get through the airport. The sun was shining and it was about 30°C, a great start to the holiday. Whilst most people jumped into a taxi we caught a bus from outside the airport into Girona, it was only a 30 minute journey and cost just a few euros each. It's possible to catch buses from here to Barcelona and many resorts along the Costa Dorada. Our home for the night was Hotel Condal in the centre of Girona, a double room here cost €65 per night. The staff were really friendly and the room was a decent size with air con and wifi. The hotel was about a 15 minute walk away from the old part of the city. My wife had spotted a vegan restaurant in Girona called Veggana. Knowing it may be tricky to find vegan options over the coming days on the coast in Calella we decided to eat here tonight. The chap running it seemed fairly friendly and it offered a varied selection of reasonably priced items on the menu, most of these were tapas sized costing €4 each. The dining area was hot with no natural light, not the most pleasent of environments to dine in. We were here now though so we took a seat and requested a menu. The local wine was very good and just €6 a bottle which seemed really reasonable. We decided to order a selection of dishes and share them. 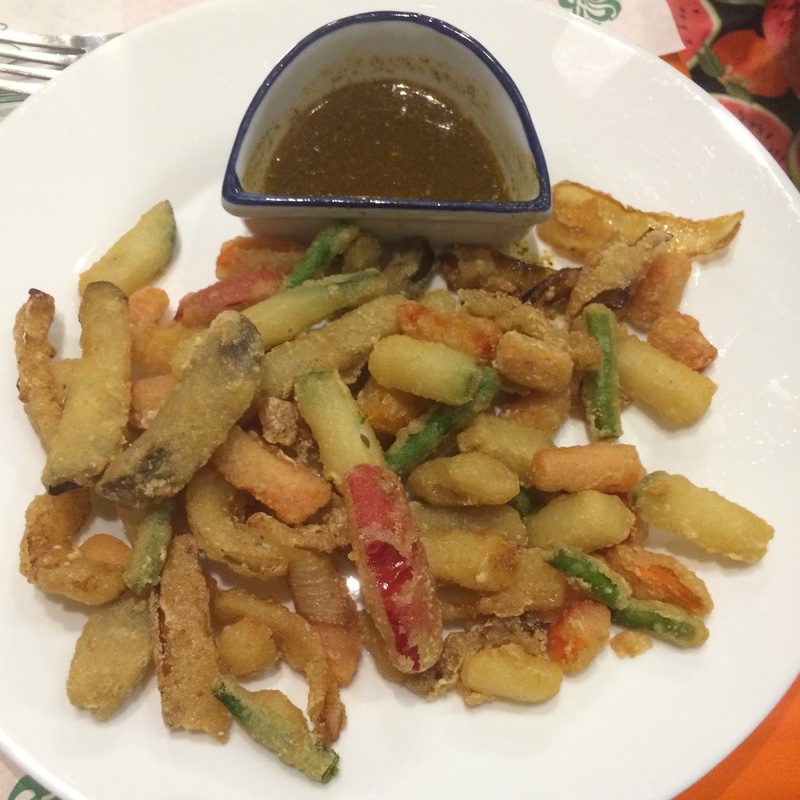 The seven vegetable tempura with chimichurri sauce sounded like a good option. We found it to be quite disappointing though, really small pieces of vegetable in a very oily batter. My wife wasn't impressed with it at all leaving me to eat most of it. We were expecting far bigger vegetable pieces in a much lighter batter. Perhaps we'd been spoilt in the past with the excellent vegetable tempura served at Shiki Japanese restaurant in Norwich. Next to arrive was artichoke sweet hearts brochette with potatoes and chimichurri sauce. These were quite nice but a feeling of slight disappointment started to set in. The fried seitan kebab was quite nutty and seasoned well, we'd eaten much better seitan back in Norwich in the past though at Olives where it's served in strips with a much better flavour. Seitan is essentially a dough made with wheat gluten, high protein wheat flour and liquid, it's sometimes known as wheat meat because of it's texture. When made and seasoned correctly it is really delicious, sadly it wasn't really up to scratch here though. The final dish to arrive was peppers stuffed with hummus of eggplant and green sauce. It was presented well but tasted quite bland, the highlight of this meal was definitely the bottle of wine. After a pretty disappointing first meal we finished our wine and decided to go and explore Girona. We made our way towards the river in search of the old town, when I first saw the river I was quite underwhelmed. As the river widened the architecture started to look far more impressive, in the distance we could see a bridge which crossed over into the old part of the city. Girona has eleven bridges and this is the most famous one, Eiffel Bridge. It was constructed by Gustave Eiffel just before the construction of the Eiffel Tower in Paris. The bridge crosses the Onyar river and offers stunning views of the colourful buildings in the old town which line it's banks. The buildings reflect beautifully onto the river below and towering above them in the distance is Girona Cathedral. As you cross the bridge at the other side, some steps take you through the buildings and onto Rambla de la Llibertat down below. As we passed this ice cream display I caught a glimpse of Werther's Original flavour, this I had to try. A 2 scoop ice cream cost just €2.50, the coconut ice cream was really nice but the Werther's Original flavour was just like the sweets, they'd perfectly captured the flavour in an ice cream. There were some pretty impressive shop facias to be seen along Rambla de la Llibertat. We'd read about an old wall high up above the city which can be walked along. These steps looked like they might take us in the right direction. We made our way as far back in the old town as we could but still couldn't find the city wall. We decided to find out more about the location of the wall at tourist information in the morning. This spot did give us excellent views across the city though so it was well worth the walk to get here. Girona Cathederal also known as the Cathederal of Saint Mary of Girona dominates the skyline of the city. In front of the Cathedral are some steps leading down into a square. The sun was starting to set and it looked quite dark down below. When we reached the square at the bottom and looked back up though the cathedral was still lit up by the sun. We noticed this a few times in Girona, the light can play tricks with your eyes. Most of the streets in Girona's old town are cobbled, we decided to walk these streets in search of a bar. This looked like a good place to stop for a drink and watch the world go by. Once again the streets seemed really dark but the sky was still perfectly light. Basilica de Sant Feliu can be seen towering into the distance with it's unusual spire. No not Campari but a glass of sangria, with it came a bowl of rather nice nibbles. Not everywhere in Spain brings out complimentary snacks with drinks so it's always a nice surprise when they do. We were quite excited when these olives arrived with our next round of drinks. The truth is though that they were the bitterest olives we'd ever tried, the bitter taste in our mouths stayed long after the drinks were finished. On our way back to the hotel we spotted this lovely looking restaurant. The menu offered some delicious sounding dishes as well as a few vegan options. We kicked ourselves and decided to call it a night, we had a wall to explore in the morning. Day 2 - The city walls of Girona and moving onto Calella. 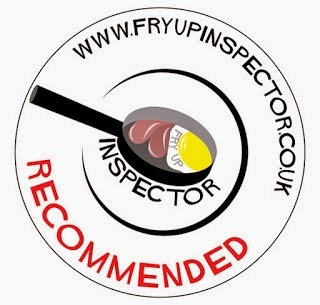 All in all a bad food day, that fry up at Stanstead is a joke, you expect to get ripped off price wise but the quality should be better. And the Vegan restaurant has done nothing to further that cause. Better luck tomorrow. That fifteen quid breakfast though. I'm surprised they didn't just wear ski mask and beat people over the head with a kosh before stealing their wallets and have done with it. Disgraceful.